First, in 8-10 one-hour meetings, I make an assessment of a trader’s experience and his problems. For newer traders, I give several specific setups that should yield 6-10 trades a day. These setups give new traders a giant head start and a rational starting point from which to build and develop their own unique trading style. We, then, establish reasonable short term and longer term goals for improvement in the trader’s performance. Together, the trader and I develop a detailed written trading plan including set-ups, sizing, risk and loss limits as well as strategies to exploit winning trades and maximize winning days. After our 8 one-hour Foundation Meetings, we will speak for half an hour each day, Monday through Thursday, for the next four weeks. During each day’s meeting, we will go over a chart marked with the trades the trader took, establish strategies for improvement, and make an outline for the next day. Our goal during these four weeks is for the trader to become competent and confident in executing our mutually-developed Trading Plan. In many of these sesssions, we will trade together during the live market session with you placing the trades and me coaching you live, one-on-one. After the four week, four-day-a-week half hour sessions, we will have established our plan and our goals. For the next 12 weeks, the trader and I will meet twice a week to move his trading forward: hone his understanding of the market; establish and monitor his discipline; oversee his implementation of the agreed Trading Plan; and make plans for the trader’s long term growth. After the completion of the program, outlined above, I remain available for ongoing coaching and consultation on an hourly basis. The cost of the Mentoring Program is $6,000, which can be paid $3,000 to start followed by two payments of $1,500 payable in 30 days and 60 days, thereafter. After the initial 48 sessions, I am available as a mentor on an hourly basis with the trader buying blocks of 5 hours for $1,500. Mentoring charges are payable in advance and may be paid by check, bank wire or by Visa, MasterCard or Discover through PayPal, below. I help traders to be their best by implementing rational trading strategies within a risk framework that attempts to quantify and limit losses and exploit opportunities. I love coaching traders and I am pleased to have dozens of traders from around the world who started as Electronic Trader Mentoring Traders and have become better traders and my friends. E-mail me or call me at +1-312-685-5333 and let’s talk about taking your trading to the next level. For struggling traders, the trader and I design a comprehensive plan to help the trader overcome his problems in trading (fear, uneven discipline, lack of confidence, etcetera) and, at the same time, leverage the trader’s positive experience and develop strategies to move his trading to the highest levels of consistency and profitability. For experienced, already successful traders, the trader and I design a program that begins with the trader’s already successful trading strategies and adds opportunistic trade sizing, structured risk management, and trader accountability strategies to help the experienced trader move his trading to the next important level in terms of profitability and consistency. I have been trading for a couple of years, attempting to teach myself without much success. I’ve always been able to turn a profit, but never able to hold onto my gains inevitably I gave it all back and then some… generous soul that I am. Upon learning of Jeff Quinto’s Mentoring Program, I subscribed immediately. After he untangled some of my messy trading ideas I started to see positive results almost immediately. Jeff has a unique ability to impart his vast experience in a clear, concise manner along with a good dose of humor. He immediately sets you on the correct course – build a business plan, define trading objectives, address your trading issues, meet head on and resolve all those “little whispers” running around in your head… doubt… fear… greed… indecisiveness… frustration… and more. I believe the most powerful aspect of Jeff’s program is the one-on-one sessions (52 of them). Each day he reviews your trades. He zeros in on the real issue immediately focusing you on the best solution. Jeff has an amazing wealth of knowledge and experience in the markets. He is uniquely qualified as Coach and Mentor using this knowledge and keen market intellect as building blocks necessary to strengthen your trading skills. It bears repeating his wonderful sense of humor and humility is a breath of fresh air. I am about two thirds through the program and I can see dramatic improvement. I know this will become a long term relationship as I continue to use Jeff’s Mentoring services. I had done newsletter investing for many years. But had grown tired of simply watching choices being made for me and wanted to learn more about the markets by doing some day trading. So, I put a lot of my spare time into reading, studying and attending various trading and psychological transformation seminars. Eventually I felt ready. My day trading adventure lasted all of twelve trading days before I decided to lick my wounds and save my remaining trading capital. Something very essential was missing and I thought a trading coach might help me identify how I to improve my trading. So, I sifted through the many coaching and mentoring offerings mentioned in trader’s forums, on the web and those I ran into through word of mouth. Eventually, through a very respected source, I found Jeff’s website. I was immediately drawn to the structure of his program and his long experience, directly trading in the markets. But I only decided to sign up after talking to him about his systematic and continuous improvement approach trading. “So here we are.” These words often start our sessions and have come to represent for me Jeff’s direct, yet subtle mentoring style. For to me, this phrase reminds me to stay focused, attend to the market, my trading plan, and move beyond excessive judgments about “mistaken trades.” Now, four months into the program, Jeff has helped me create my own unique personal trading approach and a confidence to trade the e-minis successfully. It is not because he handed me the perfect setup or a magic indicator. It is because he helped me cultivate an understanding to recognize where to place the trade, when to get out and develop a courage to stay in. I can’t say this process was easy, that it matched any of my preconceived ideas about trading or that I have nothing left to learn. I can only say that this very satisfying place in my trading journey would not have been possible without Jeff’s experienced guidance, warm personality and wonderful sense of humor. He really has a great knack for working at one’s own level of understanding and pace. Jeff, I am grateful for your teachings and look forward to our continued relationship. Just to let you know, I am totally rejuvenated now. MY mindset has changed 180 degrees on some money management concepts I always steadfastly resisted before. My “contrarianism” was useful for me before to build total confidence and self reliance in my scalping strategies. But now I clearly recognize the need for much more intelligent structuring of risk control as a higher priority than I gave to it previously. The bonus I now see for my strategizing, is that the improved structure facilitates much better “bang for the buck” in terms of potential for every contract I put on. Also, it opens up the advantages of trading other contracts, such as the Russell, Dow, and Dax. Now I evaluate my plan for any market with the emphasis on how to work the money management, with totally different possibilities emerging from the entry exit parameters. Although I came to you primarily to find ways to better define risk, and to grow in capability for advantages of more profitable position sizing, I am finding that your mentoring has benefited all the other aspects of my trading—-strategies, precision, aggressiveness, limits to risk, better gain per contract and per trade, and so on down the list. The biggest bonus is, it seems to have opened up a flood of creativity and a freedom from “ruts”. It is quite remarkable for me to see all the effects from the process you facilitate so effortlessly and skillfully. But now as I experience it, it all makes sense. You are like a rock, grounded in the most important principles which ensure intelligent trading. So no matter what I could throw at you, you could always logically frame my perspectives against the back drop of simple trade management principles. Little by little I started to see a vastly expanded set of variables as a framework for my own good and bad habits in trading. Somehow, out of this process, it becomes much easier to just drop anything which is too questionable in its value. It appears you are really good at guiding the horse to the vicinity of the water, but instead of trying to make him drink, this horse can’t wait to dive in the water. That reflects great teachership. Because most likely anyone could tell me (probably like most traders) anything, but I would never get it, unless I work through it for my own conviction. Your skill and experience mentoring, drawing out the discoveries, seems to result in the effortless accomplishment of all the objectives. Thank you so much for your wonderful guidance, support, and sharing of so much. I am looking forward to great things to report in my progress and further work together down the road. Jeff has been my mentor for 8 months now. I first started as a participant in his mentoring program. This phase lasted 3 months, during which I talked to him on a daily basis. I am now talking to him twice a month. 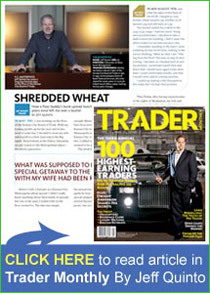 When I first contacted Jeff, I had been researching trading strategies for some time. In addition, I had been working in the industry for 3 years. I started my career on the execution trading desk of a major US investment bank in Tokyo, and I am now working as an analyst for a hedge fund in London. Despite the appearance, I did not find these jobs fulfilling, and I wanted to go on my own and become a successful independent trader. I contacted Jeff, and our first discussion gave me a very good impression. Jeff was very friendly, and I could feel that he had a real passion for coaching younger traders and helping them become more successful. When we hung up, I knew that I would be able to learn a lot from him, and that it would be fun. And the actual experience exceeded these expectations. Naively, I thought at the beginning that he would teach me a strategy with an edge that would easily turn me into a profitable trader. This naive thinking was the result of what we are taught in school, and later at work – learn the method well from your teacher/boss, execute it without mistake, and you will be rewarded. Trading is very different, and Jeff really helped me understand this. He did give me a framework to work from, but it was just a starting point, from which he helped me discover and craft a unique trading strategy adapted to my personality and way of looking at the market. More than teaching me a system, Jeff helped me understand trading and the mindset that goes with it. This is the most valuable thing for a beginner, and it helped me develop quickly and avoid a lot of costly mistakes. At the beginning, we covered the basics – his view of the markets, and the basic rules that a trader should observe to maximize his chances of success. Every day, I drew on my charts the trades I had made on the simulator, and Jeff gave me feedback on each trade. This interaction was extremely valuable, as it showed me how a successful trader thinks, and instilled in me the right mindset and attitude. I believe that what differentiates consistently profitable traders to consistent losers is the mental attitude, and this is the most valuable thing I learnt from Jeff. At the beginning, Jeff also helped me write my trading plan, and as my trading developed and more questions came up (such as, for instance, shifting from a system with fixed profit targets to flexible profit targets, how to improve the profit/loss ratio, how many contracts I should trade, how large should the account be, maximum daily / weekly / monthly losses, etc. ), he was there to discuss and guide. He also helped me write a very precise and logical trading plan, which had a very positive impact on my trading. At the beginning, I was making more than 20 trades in the afternoon session, and was consistently losing money. My trading was relatively random, not disciplined, and characterized by psychological pain. The placing of certain orders (e.g., “stop-loss” orders, where permitted under local law, or “stop-limit” orders) which are intended to limit losses to certain amounts may not be effective because market conditions may make it Impossible to execute such orders. Strategies using combinations of positions, such as “spread” and “straddle” positions, may be as risky as taking simple “long” or “short” positions. Market conditions (e.g., illiquidity) and/or the operation of the rules of certain markets (e.g., the suspension of trading in any contract or contract month because of price limits or “circuit breakers”) may increase the risk of loss by making it difficult or impossible to effect transactions or liquidate/offset positions. If you have sold options, this may increase the risk of loss. Further, normal pricing relationships between the underlying interest and the future, and the underlying interest and the option may not exist. This can occur when, for example, the futures contract underlying the option is subject to price limits while the option is not. The absence of an underlying reference price may make it difficult to judge “fair” value.